The North Mill built in 1804 at Belper houses the Derwent Valley Visitor Centre though on this occasion I only walked around the outside of the impressive site, the west part of which is still in use to manufacture stockings. Much of Belper was built by the Strutt's who , including the housing for their workers in which I was staying in Long Row with one of my son's and his family. Originally Unitarians, as they moved up the social ladder they also built a Congregational and finally an Anglican church. Jedediah Strutt was a partner of Richard Arkwright and built the world's second water-powered cotton mill here around 1781, with the first North Mill three years later. When this burnt down in 1803, his son William Strutt replaced it by the current 'fireproof' North Mill. Its iron frame and brick arches with brick and tile floors made it one of the most technically advanced buildings of its age. Samuel Slater worked in the mill from a young age and was apprenticed to Strutt in 1782. Seven years later, having learn all the secrets of the trade, in 1789 when he was 21 he took what he had learnt there to Pawtucket in Rhode Island where he began the US textile industry, becoming known as "The Father of the American Industrial Revolution" - or in Belper as "Slater the Traitor". The largest building on the current site, and Belper's most prominent landmark is the Accrington red-brick East Mill with its distinctive tower, built by the English Sewing Company in 1912. All of the older buildings on the west side of the road - including the 1795 West Mill which made up around half of the complex have been replaced by more modern structures. Water which flows from close to the site of Strutt's original weir through the Riverside Gardens is still used to run turbines which provide electrical power for the site, and the Horseshoe Weir, built to provide power for the West Mill and dating from around 1797 is still a prominent feature, apparently largely unchanged since it's height was raised in the 1840s. 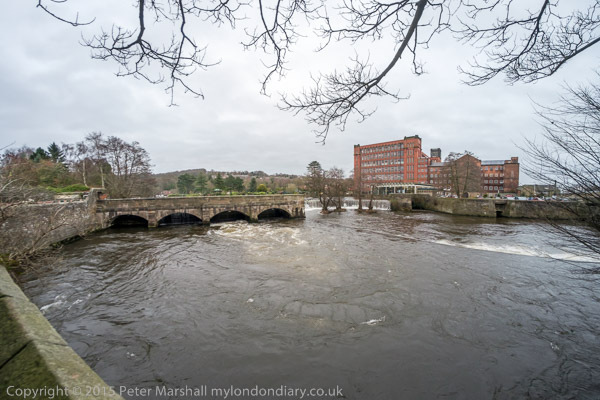 After walking around the mill site and the Riverside Gardens to the north we went along the A6 Bridge St into the centre of Belper, then down to look at the now empty Thorntons factory on Derwent Street and other former industrial buildings. Returning to the A6 we walked down as far as another empty mill building and then up towards the Market Square before going to St Peter's Church (1864) and then back to Long Row making a brief detour to look at the 1778 Unitarian Church. The town won the High Street of the Year award for a Market Town and is really like stepping back into the past, with small shops, various local community projects etc. It still has much of the character of the 1950s, and though there is a Morrisons at the edge, it successfully fought off a Tesco. It has a independent cinema, the Rex, numerous pubs including a Black and White Swan, the Kings, Queens and Nags Heads, several decent restaurants and more tea shops than you could ever need. Its population of 20,000 seems to have produced more than its share of actors and writers, and seems to almost entirely lack ethnic diversity. The following morning we walked into Belper to buy sandwiches for our journey at Fresh Basil and then went to another of the town's many tea rooms, the Beaurepaire Patisserie, worth a visit both for the cakes and the loo. We still had half an hour before our train when we left, and strolled around the Memorial Gardens, which have come under heavy attack by knitters with quilts and animals on trees, seats and lamp posts. We then walked on up hill through the Market Square to the gardens of the small 13th-century St John's Chapel, now a heritage centre (though I've yet to find it open) and a little further on before returning by a different route to catch our train. 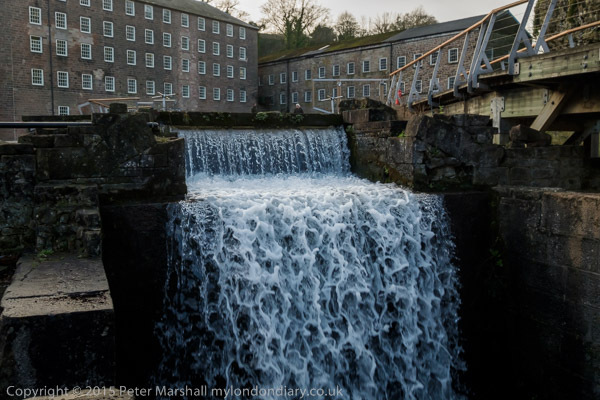 'The Valley that changed the world' is the proud claim on the Derwent Valley Mills World Heritage site leaflet, and it was here in Cromford that Richard Arkwright built the world's first successful water-powered cotton spinning mill in 1771. Cotton spinning ended here in the 1840s due to problems with the water supply and the buildings and site were put to other uses, from 1922 to 1979 as a colour works. It was saved by the Arkwright Society and after local authorities had decided it should be demolished and is being slowly and carefully being restored. It is now Grade 1 listed and an important part of the World Heritage site. The area is one with fine walks, and we had come to Cromford from Belper for a walk along the hillside to the west, coming down to the wharf on the Nightingale arm of the canal (now dry beyond the railway line) and then walking back to Cromford Wharf alongside the canal. I would have enjoyed the walk more if I hadn't slipped on a very muddy slope. Although the soft mud softened the impact, it also soaked my lower regions and covered the seat of my trousers with a surprisingly tenacious and thick deposit. The canal was supported by Arkwright, opening shortly after his death and its main cargo was coal, lead and iron ore as well as limestone from the quarries around the area. The Nightingale arm (built by Florence's uncle) took lead ore to a smelter at lea, close to the Leawood pumping station that raised water for the canal from the River Derwent. After lunch at the Wharf we walked across the road to Cromford Mill and spent an hour or so looking around it before catching the train back to Belper. Last time we tried to do this walk we got lost and had to struggle through dense woodland and boggy areas. This time we got lost again, mainly because my companions insisted on walking in the opposite direction to where I said we should go because it looked like a better path. It was a better path, but took us to Wraysbury station rather than Hythe End, meaning we had an extra 2 miles to walk, mainly beside a busy road. Later we added another almost half mile when we found the path on the weir across the Colne Brook was fenced off and we had to turn back and take the road. It was a gloomy day, with a bit of rain, but we decided to retry the walk. I wanted to do it in reverse, which would have made it easy to follow but was voted down by my companions. Later when they turned and walked alongside the Colne Brook as the walk map showed I pointed out that we were going in completely the wrong direction and were going upriver rather than down, but again my advice was spurned. 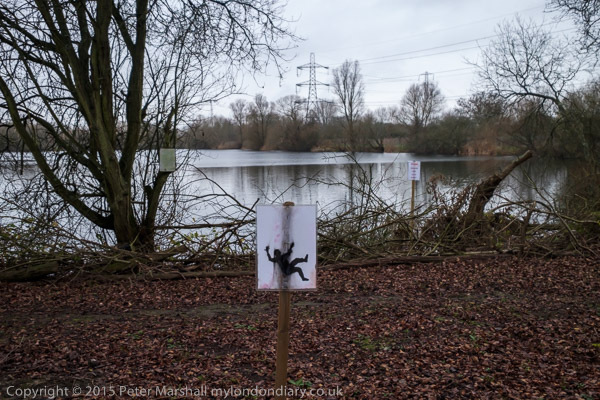 When they finally admitted I was right as we came to Wraysbury Station it would have been quicker to turn round and walk back to find the right path, but I didn't suggest that - who knows where we might have ended up, so we took the long way around on the road. The road from Wraysbury to Staines was rather busy, and although there is a path or pavement, not a pleasant couple of miles. Coming up to Hythe End we took the public footpath down Ferry Lane. There hasn't of course been a ferry for many years - probably since the 1930s, but in any case we didn't want to go across the Thames, but simply across the Colne Brook, one of three major streams that carry the considerable flow from the Colne Valley into the Thames. A few hundred yards down Ferry Lane runs next to the stream and at a weir a footpath leads across it. But now that path is blocked by fencing, and we had to retreat and take the route around by the road. By now our walk had taken over an hour longer than anticipated and it was really getting dark as we made our way across the Lammas Park (open until 6pm despite the 4.20pm sunset) and along the unlit riverside path into Staines. Fortunately I had a torch in my pocket as it was hard to see the puddles and muddy stretches in the dark. There are no trains in our area on Christmas Day or Boxing Day and for many years when we have been at home for Christmas we have walked on one of the two days to have a Christmas lunch at my sister's house - and on the other of the two days they drive to us. This means we get two Christmas dinners and also enjoy a healthy walk to get an appetite, around 5 miles if we take a direct route mainly alongside the Thames, though this year we added a few more by wandering around in the woods above Runnymede. We started off in sunshine, though the forecast was for rain and there were some interesting skies and lighting. We crossed Staines Bridge and I took a picture of the river. By a strange anomaly I think I was still standing in Staines, which crosses the river at this point, as when the border of the civil parish was established it followed the old course of the Thames and went along what was then a stream of the river which ran around an island rejoining the rest of the river where there is now a small bridge at the centre of the image. When the river is in flood, the dip towards the right of the picture fills with water, and it goes back to an arch of the bridge. now on dry land. The boundary is unclear on the latest OS maps, but can be seen clearly in older versions, running just to the north of The Causeway, an ancient structure now the A308, and turning north through where Halfords now stands to the main river at Three Counties End, still marked. Here Buckinghamshire, Surrey and Middlesex met. Now there are only two counties, Surrey and Berkshire, though the latter since 1998 is now the Royal Borough of Windsor and Maidenhead, while Surrey is both Spelthorne and Runnymede, so there are still three administrations for some purposes. 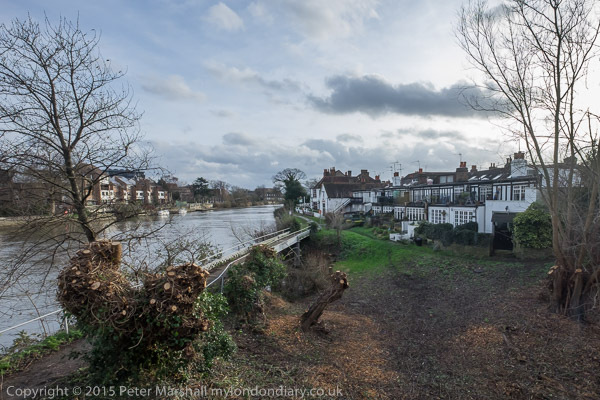 This small remnant of Staines on the Surrey bank of the river is why when Spelthorne decided to impose a ridiculous change of name on Staines they decided on Staines-upon-Thames rather than Staines-on-Thames. Of course all of us who live in Staines still call it Staines except for a few who are estate agents. 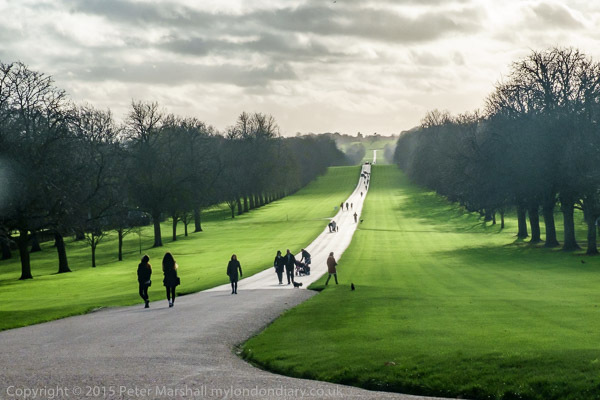 You can read more about the actual walk in Boxing Day Walk on >Re:PHOTO. In a protest against sponsorship of arts institution by one of the leading global polluters BP to give itself an false positive image, 'actor-vists' from 'BP or Not BP?' staged a performance of a play depicting 'BP executives' giving a farewell party to departing Museum director 'Neil MacGregor' inside the British Museum’s Great Court as visitors and security stood and watched. 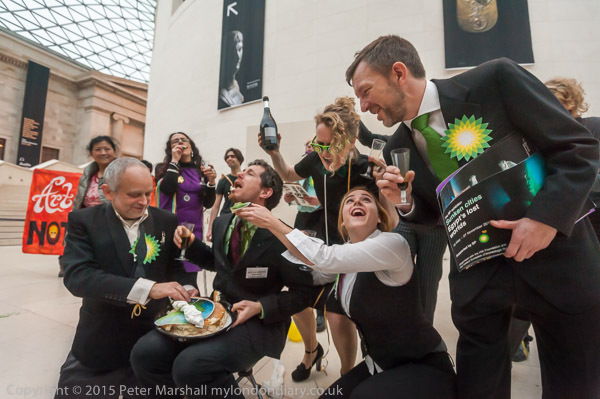 The group along with others concerned with climate change call for the museum and other art institutions to stop accepting sponsorship from BP and others whose activities are accelerating global warming. The museum protest came only a week after activists were arrested in the Louvre during the Paris climate talks for opposing sponsorship there by oil companies Total and Eni. BP makes a relatively small contribution to the museums budget, a fraction of a percent, for which they get an engraved message on the wall of the rotunda in the Great Court and their logo prominently on the publicity for the museum's major exhibitions, including Vikings, Ming, Indigenous Australia: Enduring Civilisation, the Mexican Day of the Dead and Sunken Cities, the last two perhaps particularly unfortunate as BP has been given the largest corporate criminal fine in history of $18.7 billion for the underwater Deepwater Horizon oil spill which caused huge pollution of the ocean around the coast of Mexico. The current 5-year sponsorship deal between BP and the British Museum ends shortly and the museum and its new director will soon have to decide whether to renew its with the oil giant. While a good deal for BP, the amount concerned is a relatively small contribution to the museum's budget, and thanks to the activities of BP or Not BP and other climate activists results in a great deal of bad publicity for the museum; hopefully they will look for less toxic sponsors. Around 20 performers made their way into the museum largely unnoticed, carrying props and banners in bags, under coats and in pockets, and grouped in the Great Court in front of the Rotunda, close to where the message of thanks to BP is engraved in the wall. The performance began with all the cast having a party and singing a song about departing director Neil MacGregor giving BP "cheap branding and a social license to operate through all the oil spills" to the tune of Robbie Williams’s ‘Angels’, then leaving the stage to three 'BP executives' who were shortly joined by the actor playing Neil MacGregor, who they thanked effusively for his support, listing and commenting about some of their activities including the various exhibitions. You can read the text of both songs, and the script of the play, although the actual performance contained considerable improvised embellishment, on the BP or NOT BP? web site, along with several of my pictures. I was pleased to be asked to photograph the event and supplied them with a large set of the best images to the group; except in a couple of cases where there were no suitable alternatives I have used other images on this site. A security man had come up to the group as they started their performance and was assured it would be short, after which the protesters would leave quickly without any trouble. The museum seemed to take them at their word and decide that it was best not to try to intervene or call the police which would have caused a greater disturbance - and more publicity. At the end of the show the protesters did pick up everything and wipe the floor clean before they marched away, singing more songs about BP towards the exit, stopping for a short protest in the museum foyer before moving to the portico outside, where they gave another performance there of the play. 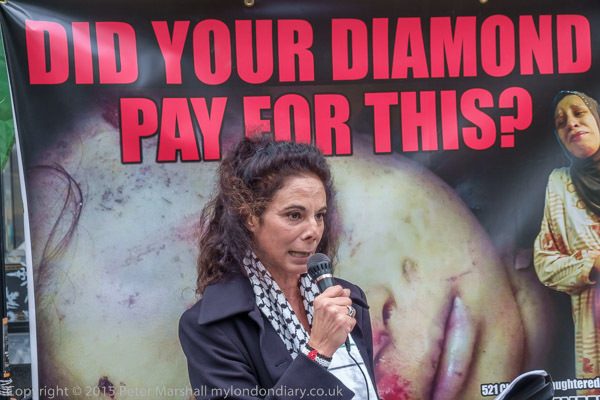 Protesters picketed Tiffany whose partner and supplier is Israel's Steinmetz Diamonds Group whose foundation funds the Israeli Army's Givati Brigade, accused of war crimes including the massacre of 29 members of the Samouni family in Gaza in 2009. Protesters stood with banners and Palestinian flags outside the Tiffany shop in Old Bond St, attracting considerable attention as they informed customers entering and leaving the shop about the provenance of the diamonds that were on sale inside. 'Blood on your hands' shouted one of them, and a lengthy speech explained the role of Steinmetz, whose Foundation 'adopted' the Israel Army's Givati brigade, "fostering close relationships with the commanders and their soldiers", and "buying equipment " for them during Operation Cast Lead, the attack on Gaza. The UN Human Rights Council has accused the Givati Brigade of war crimes in Gaza, and one of the banners at the protest was a long letter from the Samouni family. Tiffany's part-funded Steinmetz's Kiodu diamond mine in Sierra Leone by $50 million and Steinmetz, through its Octea company, provides Tiffany's with cut diamonds. The protest was part of a campaign by Muslim education campaign Innovative Minds and the Islamic Human Rights Commission (IHRC), both UK based organisations who work together on various campaigns including the Palestinian Prisoners Campaign and support a boycott on Israeli goods as a part of the campaign for a free Palestine. The campaign includes both Muslim and Jewish supporters among others and is always clear that its opposition to the actions of the Israeli government is in no way anti-Semitic. Protesters outside Willesden Magistrate's Court supported the protesters arrested for obstructing High Court bailiffs during the eviction of Sweets Way estate in September. 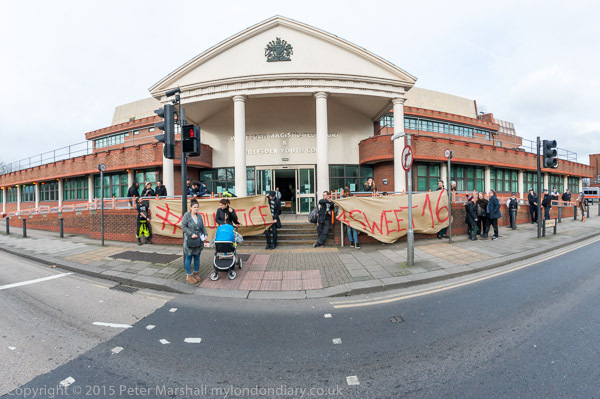 I left before the verdict was given and today's #Justice4Sweet16 defendants were given a conditional discharge. When I arrived a group of around a dozen supporters were outside the court and wondering where best to put their banners. They held them for some time one on either side of the court entrance, but although the police appeared fairly relaxed they would not allow them to be fixed on the railings. After around an hour when more people had arrived to show their solidarity, they decided to move the banners to the fencing around an empty office building on the opposite side of the road, where they managed to secure them. Some of them put up a third banner with the message 'guilty of caring' but were quickly told to take it down until after the verdict. 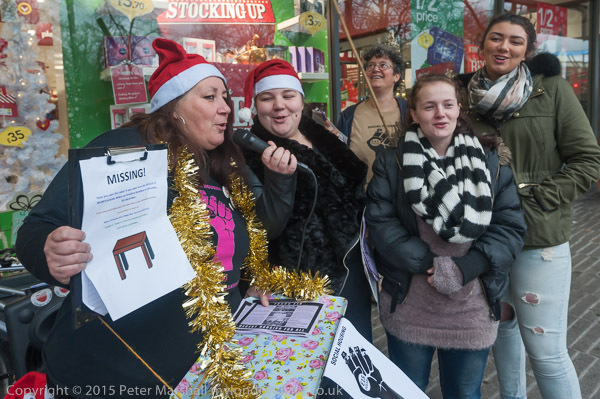 Among those who came were a group from Brent who had brought some rewritten anti-austerity Christmas Carols with them and some of those present joined in singing these. 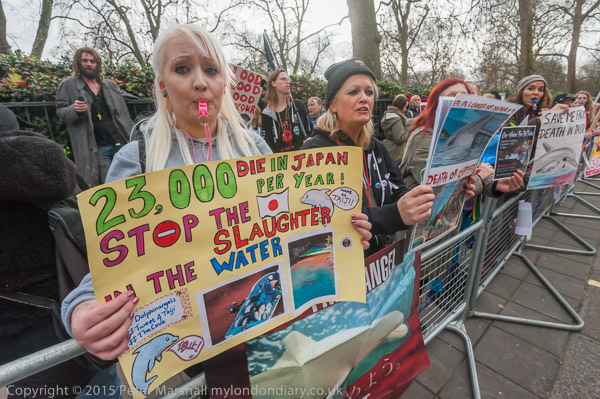 A protest outside the Embassy called for an end the the annual slaughter of over 20,000 dolphins, porpoises and small whales in Taiji Cove in Japan, where their blood turns the sea red. and all the other groups or organisations fighting to stop the brutal killing at Taiji, where observers filming the fishermen killing the dolphins trapped in the shallow water are often subject to attack by Japanese groups who see the slaughter as a Japanese tradition. Two other protests were taking place at the Japanese embassy in the short time I was there. As on every Friday, a small group of Japanese and British protesters were handing out leaflets in a protest against the continuing nuclear tragedy at Fukushima, where radiation is still leaking, and I talked to a couple of them before they left to protest outside the offices of TEPCO (Tokyo Electric Power Co ), now moved to a less conspicuous building on Piccadilly. I've photographed these regular Friday protests before (here and here) and didn't on this occasion take more pictures. Due to start a couple of hours after I had to leave was a protest against Japanese whaling, but already there was one man standing outside the embassy with a placard, talking with the police there. The Taiji protesters were behind barriers on the opposite side of the road for a lengthy protest, due to last six hours, but I had to go after just over half an hour to cover a protest elsewhere. Protesters gathered outside the AGM of London-based multinational Global Coal Management Resources Plc to present them a notice of closure for the opencast Phulbari mine which would displace more than 130,000 farming families and many tribal people. The giant mining company BHP was awarded a mining contract for the Phulbari region of Bangladesh in 1994, but in 1998 sold it to Asia Energy, which in 2003 became the UK-registered Asia Energy, changing its name to Global Coal Management in 2007 and later to GCM Resources plc. BHP apparently decided to sell because although there is plenty of coal in Phulbari - of 572 million tonnes - they felt that at 151 metres below the surface it was too deep for strip mining. Asia Energy's share price plummeted, dropping immediately to half its value - Phulbari was their only real asset. Since then the company has made efforts to regain permission to mine, and the US government have also tried to persuade them to allow mining, but people in Phulbari and around the world have continued to protest. But in August 2015, state minister for power, energy and mineral resources Nasrul Hamid restated at an Energy seminar that plans to extract coal by open pit mining at Phulbari and Barapukuri had been dropped, commenting " We must consider high density of population and the agro-based economy of the mining area." Instead they plan to import coal for new power plants to come on stream by 2030. The leading political parties have stated their opposition to any mining. Later in 2015, the UK government issued a very critical statement regretting GCM's failure to carry out a human risks impact assessment and to update its plans for the mine and condemned it for breaching the international guideline on ethical corporate behaviour. It also noted the Bangladeshi Government had said that GCK has no valid contract with them (though GCM's 2015 annual report says their legal advice is that it is enforceable) and they they have no intention of allowing open cast coal extraction in the region which includes some of the best agricultural land in the country. Because of the depth of the coal, water would have to be pumped completely out of the area, and GCM proposed to distribute it among the farmers. But the water would be highly contaminated with arsenic. The company's plans to remove and preserve topsoil in a block by block mining process have also been questioned. Open cast mining at Phulbari would displace up to 220,000 people from their land, destroying their homes and their livelihoods and also threaten a World Heritage Site, the Sundarbans, one of the largest remaining mangrove forests. It would also breach the UN Declaration on the Rights of Indigenous Peoples, which states that developments can only take place on indigenous peoples’ land with their ‘free, prior and informed consent’, as it would effect around 50,000 indigenous Santhal people. The AGM apparently took place in the luxurious rooms of the Royal Aeronautical Society, just off Piccadilly in Hamilton Place. 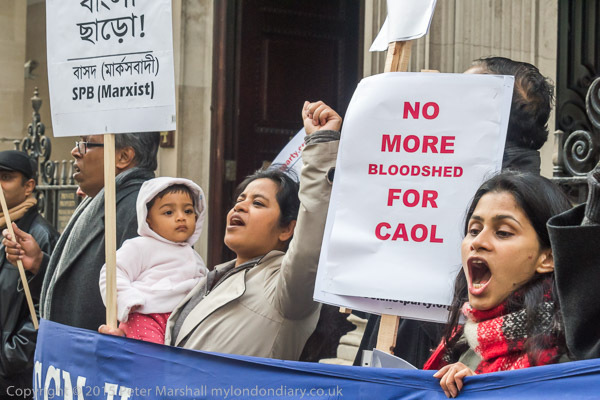 The protest, on a Friday morning, was only a small event, but included several of the leading activists from the Phulbari Solidarity Group and Bangladesh National Committee, UK branch along with other supporters. 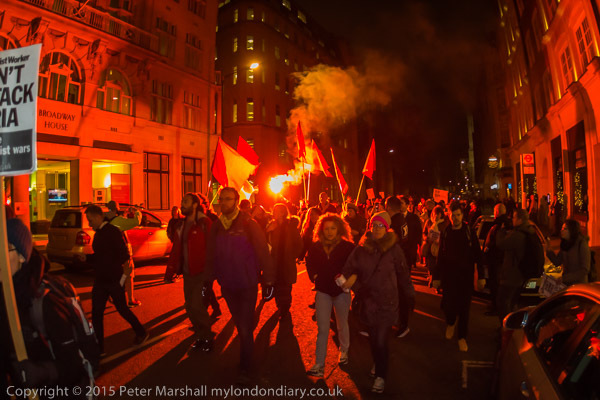 In the UK the protests have been supported by various groups including Global Justice now and the Socialist Party. The company's share price has continued to drop. At the start of 2011 they were trading on the FTSE AIM market at just over 250p; the price on the day of the AGM was 6.38p. I stayed at the protest for an hour before the AGM was due to commence at 11.00 am and for half an hour afterwards, and saw no one enter the building. The AGM report says everything was passed by a show of hands but it would seem there were very few hands to show. 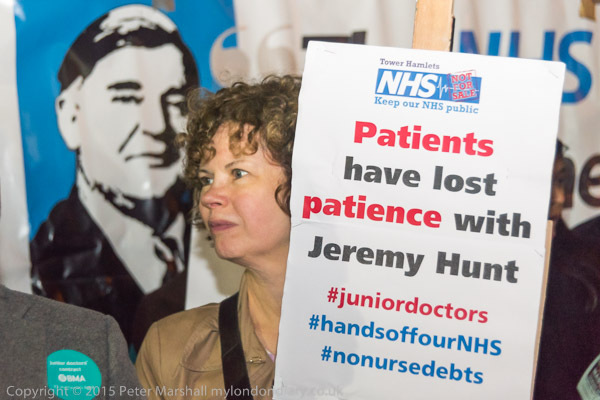 A rally outside old Royal London hospital opposite Whitechapel tube supported the NHS against cuts and privatisation, and the attempt by health minister Jeremy Hunt to impose an unfair contract on junior doctors, as well as the plans to axe the NHS bursaries for nurses in training. The contract changes that Hunt wants to impose are widely seen as a way to cut costs and make the NHS more attractive to the private companies who are increasingly gaining control of it in the government's plans for backdoor privatisation. Removing the NHS bursaries for medical trainees also appears to be a part of the same process. Nurses spend half of their training actually working in NHS hospitals, carrying out essential duties as a part of their studies, without which there would be a severe staffing shortage. Although they get bursaries while training, they are effectively a source of cheap labour. There is currently a desperate shortage of nurses, with many hospitals being unable to meet the targets set to ensure safety and most if not all relying excessively on agency nurses. Cutting the NHS bursaries will mean many students will no longer be able to afford to enroll on these courses; with many students now forced to take part-time jobs to make ends meet, the requirement to work in the NHS makes this impossible for nurses. 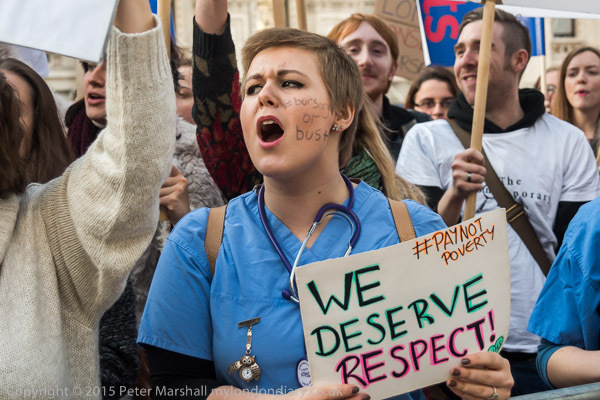 It is unlikely to make any economic sense as many nurses will never earn enough to repay their student loans, expected to amount to over £50,000 for their courses. And Jeremy Hunt surely lives in some parallel universe if he really believes that cutting the bursaries will lead to more people going to train as nurses. East London, with some of the poorest areas of the country, has been one of the areas of the country with the proudest record innovation in the NHS and of fighting its future as a public service and against cuts in provision, including that of community health advocacy services and surgeries. Most of those present at the protest were doctors, medical staff and supporters of various campaign groups including Tower Hamlets BMA, Keep Our NHS Public, Unite, the Medical Practitioners Union, UNISON and Save our Surgeries, some of whom made short speeches. Also present were three local councillors, one of whom spoke and the organiser of the protests to keep the NHS bursaries who invited us all to take part in a march being organised in January. Lighter relief was provided by the singing of Christmas Carols, with new words in support of the NHS, to the accompaniment of a four-person medical band, and a group from the National Health Singers who sang to a recording of their remarkable song about the NHS in support of the junior doctors, "Yours", which is now available on iTunes. 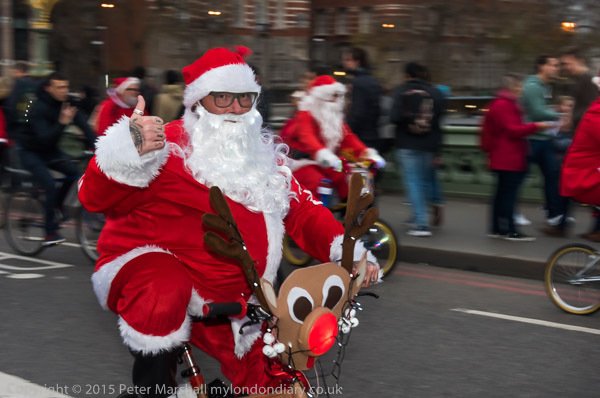 Santas were out in force in London, including a large group on BMX bicycles on a charity ride. Many, including some who had been roaming the streets most of the day as a part of the annual Santacon, ended their route in Trafalgar Square. I hadn't meant to photograph the Santas, and didn't go looking for them, but a giant posse on bikes came across Westminster Bridge while I was photographing the climate protest there, and later, as I walked across Trafalgar Square to catch a bus to Waterloo I found there were quite a few hanging around there. 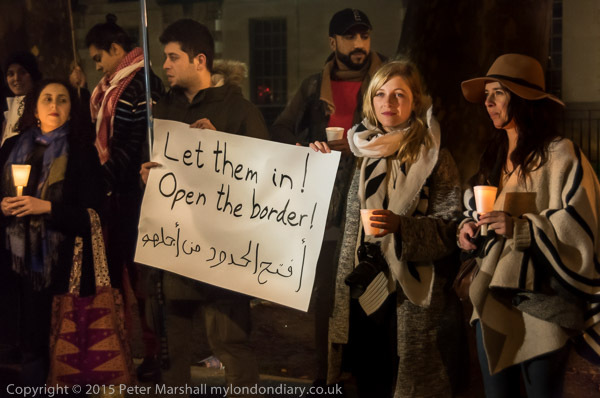 As darkness fell, refugees, solidarity campaigners and Syrian activists at a Downing St vigil demanded justice for refugees, opening of EU borders to those fleeing war and terrorism and a much more generous response from the UK government. This was a candlelit vigil, and at first there were considerable difficulties as a strong and gusty wind kept blowing out the flames almost as soon as they were lit. Someone brought plastic cups, and candles were pushed through the bottoms of these so they provided windshields and the vigil continued. Many of those taking part were Syrians, and there were several Free Syrian flags held and waved, but there were refugees from elsewhere around the world as well as some of the many British who are disgusted at the miserable response of the Tory government. Even after considerable pushing from the British people which forced David Cameron to increase the UK response, we are still only agreeing to take 20,000 refugees by 2020, while Canada will take more - 25,000 - in a single year. 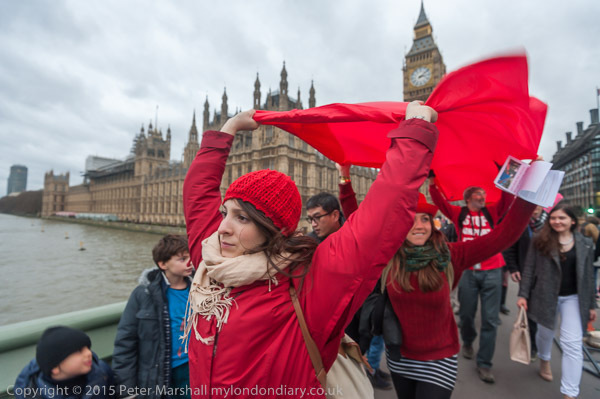 Campaign against Climate Change protested against the inadequacy of the COP21 Paris deal, which sets the target temperature rise too high and has no way to enforce the measures needed by carrying a 'red line' banner across Westminster Bridge. The campaigners met for a short rally in Old Palace Yard with John Stewart and speakers including Green Party Mayoral Candidate Sian Berry, environmental campaigner Pete Deane and environmental analyst Ken Montague and Anti-TTIP campaigner Linda Kaucher, who reminded us how that treaty would enable the giant corporations to prevent governments from carrying out effective green measures. After a woman read a short poem the group which was relatively small as so many climate activists were in Paris marched behind the Campaign against Climate Change banner and a trumpeter on to the pavement across Westminster Bridge. There they began to unroll a 300m red length of cloth, carrying it above their heads across the bridge as a 'red line'. For many countries, a maximum global temperature rise of more than 1.5C will mean disaster, and the Paris talks have not committed to this nor have they set up any real mechanism for holding countries to the more limited commitments they have made. The world needs to take urgent action to keep fossil fuels - including shale oil, with fracking now shown to be as dirty as coal - in the ground, or at least only to be extracted as chemical feedstock rather than fuel, and an increased urgency in the transition to renewable energy. While a few years ago that might have seemed expensive and not feasible, the economics of energy generation have changed rapidly with green energy rapidly becoming the cheaper source. But huge vested interests still lie behind the dirty fuel lobby. The protesters also want action from the UK government to reverse its anti-Green measures introduced since the last election, and to get behind green jobs, energy use reduction measures and renewable energy - and abandon its plans for carbon burning technologies and fracking in particular. Vital for the future of the world, these changes would also aid the UK economy. After police and council harassed the Focus E15 street stall and used force to illegally seize a table last week, activists from other groups came to give support and defend the right to protest, several bringing tables. Police & council kept away. Focus E15 have held a street stall on the wide area of pavement outside Wilko every Saturday for over 2 years, without causing any problems. They draw attention to the failure of Newham Council to sensibly address the acute housing problem in the borough, which has around 5,000 people living in temporary accommodation and while 400 homes lie empty on the Carpenters Estate close to the centre of Stratford, and oppose the council policy they label 'social cleansing', attempting to force those needing housing out of London and into private rented property in towns and cities across the country- Hastings, Birmingham, Manchester etc - and even in Wales. 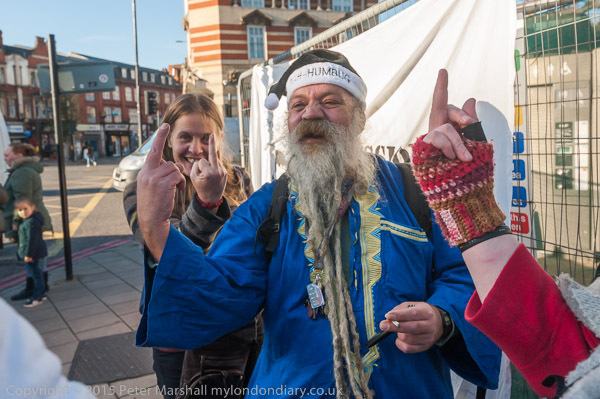 But last week, at around 1.20pm, in what was clearly a planned operation, Newham Law Enforcement officer John Oddie assisted by several police officers, confronted the campaigners and told them they were not allowed to protest there, and that unless they immediately packed up their stall, sound system, banners and other gear it would be seized. Focus E15 stood up for their right to protest and refused to move, and tried to prevent police from taking their table, but police threw it into the back of their van. It appears that one of the laws that was quoted to the protesters for the action was clearly inapplicable to this case, and that the council and police action was this an illegal act. Which may be why the council later in the week wrote a letter to the protesters asking them to reclaim the table. Focus E15 asked them to return it to them on Stratford Broadway this Saturday - but it didn't arrive. There were plenty of tables of various sizes there for the protest today, with several groups who came to show solidarity and defend the right to protest bringing tables with them, as well as Focus E15 coming with another of their own. Today's protest was one of the largest, with perhaps three or four times as many present as on a typical week, with people from Welwyn Garden City, South Essex Heckler, Basildon and Southend Housing Action, Clapton Ultras, East London Radical Assembly, Anarchist Federation, Carpenters Estate, Aylesbury Estate Southwark, Squatters & Homeless Autonomy and more coming to show support. The protest was a lively event, with speeches, singing and dancing as well as handing out leaflets and talking with those passing by. If Newham council isn't embarrassed about the theft of the table it should be, and by the considerable and often humorous mileage that was made of it. If there is still a reputable local paper for the area and not in the council's pocket, they will have had a field day on 'tablegate', but I didn't see a reporter, though there was a BBC local crew who filmed a few interviews. But even with this number of people there was never any real danger of blocking the large area of pavement. A police car did drive up as the protest was about to finish, and parked in front of the protest, but the two officers got out and walked to a shop 50 yards away, not engaging at all with Focus E15. 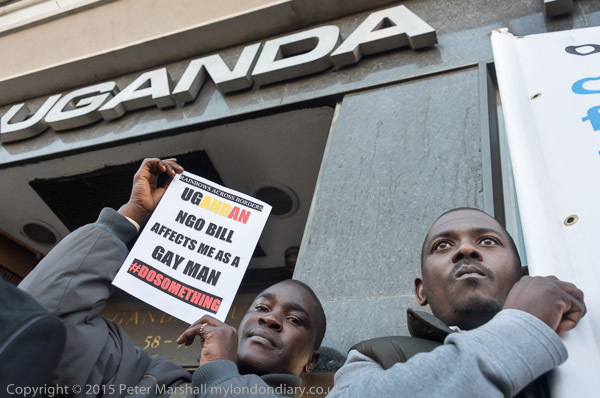 African LGBTI organisation the 'Out and Proud Diamond Group' supported by the Peter Tatchell Foundation held a rally at the Uganda High Commission in Trafalgar Square urging President Museveni not to sign the anti-LGBTI NGO bill 2015 as it violates justice and human rights. Approaching a hundred members of the Out and Proud Diamond Group turned up for the protest along with a few supporters from the Peter Tatchell formation. They held posters calling on the President to ask the Ugandan parliament to amend the bill so it no longer discriminated against gays and organisations that support them in Uganda. As well as posters and several banners, an number of those present carried or wore Ugandan flags and chants and posters stressed their love of Uganda but hatred for unjust laws such as this which deny human rights. Many of those present signed a letter to the president imploring him to stand up for humanity and justice and not sign the bill. When they tried to deliver the letter they found that the doors to the High Commission were locked. But an officer from the Met's Diplomatic Protection Group who had turned up to the protest and told the protesters to keep the doorway free and not to trespass on the steps (although the door was locked and not in use) volunteered to go inside and ask if someone would take the letter. A few minutes later he came out and told the protesters that someone would come and do so. Mental Health Resistance Network supporters protested at the Thames Reach Employment Academy where a planned launch of a Southwark 'Hub' which would replace proper mental health treatment with forced 'therapy' under threat of benefits removal to get sufferers back to work was due to take place. The launch party for the 'hub' was cancelled after the the plans for the protest became known, but the protesters went ahead in any case. 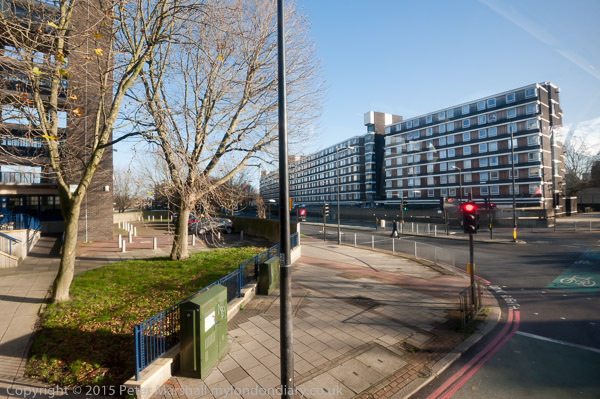 A small group met at Camberwell Green to guide protesters to to hub location for half an hour and then walked down to the Thames Reach Employment Academy where a few other protesters were already waiting. The Increased Access Psychological Therapy, (IAPT) is backed by the government largely because it is short-term therapy and thus relatively low cost, but there are considerable doubts as to it appropriateness or efficacy for many mental health patients. But it is the element of compulsion, with claimants who have mental health issues being forced to undertake a medical treatment by practitioners working in collaboration with job centres who can enforce it by 'sanctions- - that is removal of benefits - that worries claimants. They see it as medical treatment based not on assessed medical need but to meet the targets for cutting welfare payments, and as a denial that mental health problems are as disabling as physical disabilities. Outside the Southwark hub location there was a lively protest, with chanting of slogans, music, songs and speeches. A new MHRN banner with the message 'Working ISN'T Working' was brought out to stress that people with mental illnesses need treatment rather than employment, which for many will actually increase their problems. I had to leave while the protest was only in its early stages to cover another event, taking the opportunity as my bus passed the protest to take a few frames from a higher viewpoint. Class War opened a new front against gentrification in South London, displaying a ambulatory show of their posters briefly outside the Gilbert & George show based on political slogans at the White Cube gallery and at other premises in Bermondsey St.
Bermondsey, once a working class industrial area on the edge of London's docks with many small workshops in yards off of Bermondsey St producing hats, leather goods and a more recent arrival, the print trade, has changed dramatically. Run down when I first photographed there in the 1980s (and produced an industrial archaeology walk leaflet, West Bermondsey - The leather area) it is now full of restaurants, galleries, designer clothes and other businesses catering for London's new gentrification, with offices, design studios and expensive flats now having replaced most of the workshops. 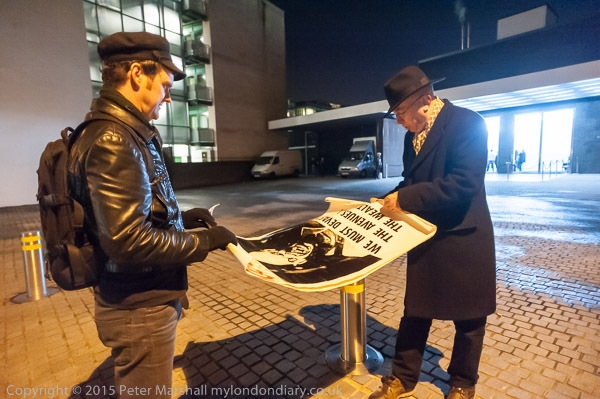 Two supporters of Class War, Ian Bone and Simon Elmer unrolled posters and walked across the wide empty yard in front of the gallery to stand where people were going in and out to a book signing by Gilbert & George. A security man came up after a couple of minutes to ask them what they were doing, and were told that they had come because Gilbert & George had used some of their work in the show which was based on protest placards and that they were expected. He went inside to check and I took some more pictures. A few minutes later a woman came out from the gallery to talk with the two Class War protesters, and she agreed that they could stand there for a few minutes so long as they caused no trouble and would then leave - as they intended. But she wasn't happy with me taking pictures, so I went and sat on the wall by the road waiting for the protest to finish. I'd already taken enough pictures. When the two walked to the street we went along to Bermondsey Square at the south end of the street, where there is a display area attached to the back of a supermarket, a long narrow empty corridor facing the square. There had been posters up inside, but these had fallen down and were lying on the floor inside. Class War couldn't get inside, but spent a few minutes fixing posters up with Blutak on the outside. Unfortunately it was very windy, and as soon as they were fixed on they blew off. It would have made a very Chaplinesque movie, but I was only taking stills, and managed a few pictures, mainly using flash as almost all the available light was from the display area behind the two figures. We then walked back up Bermondsey St, stopping to take more pictures from the street outside the White Cube, and then at several estate agents and the Fashion Museum before leaving. Class War intend to mount a continuing campaign in the area around the White Cube, with low key interventions like that I photographed tonight, at least until the end of the Gilbert & George show. Perhaps their posters will make some of those going to that exhibition wonder what the point of the works on show inside the gallery is, though I think their only point is probably that they are totally pointless other than as objects that can be sold for large amounts of money. Class War posters I think are rather more interesting despite often being given away. 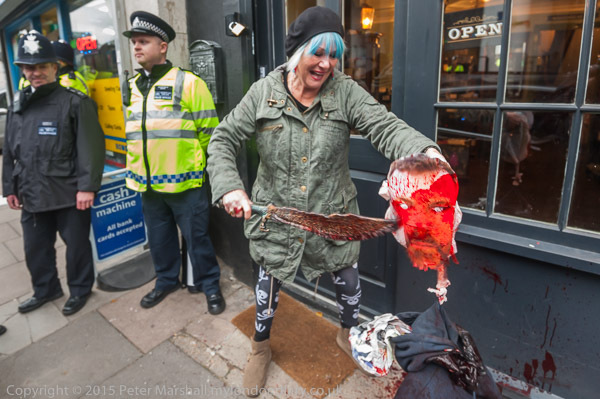 Class War re-enacted a murder outside the Jack the Ripper tourist attraction, women hacking and decapitating a dummy wearing the mask of owner Mark Palmer-Edgecumbe with a plastic scimitar and liberally spattering fake blood as others played kazoos. As well as the Class War Womens Death Brigade banner, the protesters had also brought their Lucy Parsons banner "We must devastate the avenues where the wealthy live". The Ripper, almost certainly Oxford graduate Montague Druitt whose suicide brought an end to the carnage, was a man who developed the skills and physique needed for his precise and powerful assaults on working-class women on the playing fields and courts of Winchester, and apparently wore the uniform of the upper classes, top hat, cane and cloak. His perverted crimes embodied attitudes to women and to the working class that also derived from his public school education, twisted and taken to its extremes. Their celebration in the 'museum' plays on similar fears and hatred - and the experience offered here is one that only the seriously sick would enjoy. You would indeed have to be sick to want to visit this voyeuristic 'tourist attraction', and would be extremely sick, inhuman, if you did not come out of it with a feeling of intense shame and repulsion at your prurience. There appear to be very few customers - during the hour or so today only two turned up and went away when they were told by police that the door was locked. Many of the leading supporters of Class War were at various other events around the country, and only a relatively small core were available for today's protest. They were joined as usual by others opposed to the 'musuem' including fourth-wave feminists. Class War brought with them a 'guy' dressed in jacket and jeans, with a mask of 'museum' owner and Ripper promoter Mark Palmer-Edgecumbe. Class War's Jane Nicholl had borrowed a plastic scimitar or cutlass from her grandson, and used it to attack the dummy in front of the shop with considerable vigour, bursting several small bags of fake blood that were attached to it. When this failed to make the guy look bloody enough, more fake blood was poured on, and attacks by Jane and others wielding the plastic weapon continued, and soon both dummy, pavement and this photographer's trousers were spattered by rather nasty looking bloodstains. Their attacks were rather less precise than those of the Ripper, and they were unable to match the real horror of his murders, as the dummy had no heart or womb to cut out. Police were not very co-operative, but made little attempt to interfere with the protest, although early on they appeared to object to Jane Nicholl's language - and she had been advised by Ian Bone to tone it down. It would have been appropriate also for this and earlier protests to put a couple of cones in the parking space directly outside the 'museum' (as I think they did for a protest in which the Tower Hamlets mayor took part) and I was rather aggressively warned by one officer that my cameras might be scratching the car that was parked there. At the end of the protest police tried to get Class War to take the blood-stained Palmer-Edgecumbe 'guy' away with them, but they refused to do so, saying they were donating it to the 'museum' which was desperately short of genuine exhibits like this. It looked as if they might make an arrest both as people were preparing to leave and again outside the pub around the corner they followed Class War to, but they thought better of it and walked away. When I left half an hour later there were still police on guard outside the shop. Thanks at least in part to Class War's publicity and vigorous protests over around five months others have taken up the fight against the so-called museum, and the fight to get a real museum celebrating the powerful history of the women of London's East End. It's a rich heritage with powerful and colourful figures in which the bloody murders by the Ripper are only an insignificant and entirely negative episode. Perhaps it's now time for others to take up a long-term if probably lower-key campaign here and continue it until this bloody blot on our heritage is closed down. Another short walk with aging family members, completing a walk around Windsor we started last month, followed by lunch at a pub bang in the centre of the town. Built in 1518, the Three Tuns used to be the local Guildhall before they built the Guildhall, and despite being at the tourist epicentre is still a decent pub, good beer, reasonably priced pub food, nothing fancy, and friendly staff. Don't tell too many people. Actually Windsor isn't short of decent pubs, though some places are rather pricey, particularly if you want to eat. We started this walk last month, on a very different day, in mist and rain. The route we took more or less followed the Queen's Walkway, a local heritage trail produced by the Outdoor Trust to mark 63 years of the current monarch's reign and supposedly 6.3km long with 63 points of significance. We found most of the 63 plaques set into the pavement to mark it. You can't get away from royalty in Windsor, with a bloody great castle to remind you, large barracks and the changing of the guard, but the walk is reasonably suitable for republicans with an interest in local history as well. Last month we began and ended at the Windsor Castle, where after having walked around from point 12 to 39 we had lunch. Not with Elisabeth Windsor, but at the pub near where the Long Walk crosses the road from Staines. This month we started again at 40 and walked to 63 and then 1-11, with on both occasions, a few detours. But this month it was a bright sunny winter's day. I've some the pictures from the two parts together. Healthcare students who work 50% of the time on placements during their courses are appalled by George Osborne's scrapping of NHS student bursaries from 2017. They protested saying it will land them with huge debts and deter recruitment to courses. Because they have to spend time working on placements throughout their courses, healthcare students are unable to take on part-time work as many other students do. They are working for the health service when on their placements, and this work is unpaid - except through the bursaries. It seems totally unfair to ask them to take out student loans and work for the NHS for nothing as well. Many of the jobs for which they are training are not particularly well-paid, and a higher proportion of healthcare students would probably never fully repay their loans, and the proposed scrapping of bursaries probably makes little financial sense as well as imposing hardship on those involved. Healthcare currently attracts large numbers of students who could not afford to take these courses on loans, including a number of single mothers. Recruitment to some of the courses is likely to drop drastically if bursaries are abolished. We currently have a shortage of nurses and other medical staff, and removing the bursaries would be catastrophic for the NHS, particularly as the government is making it harder to recruit non-EU nurses through its racist immigration policy. 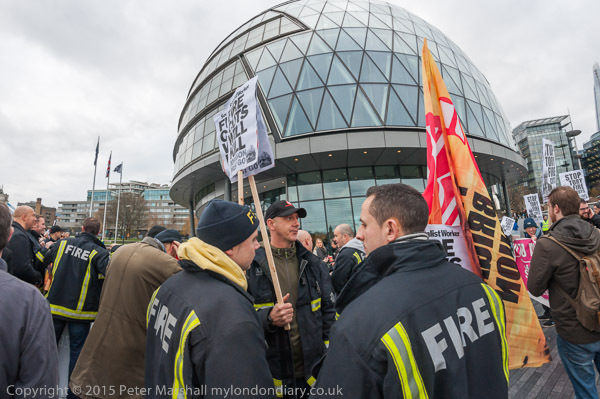 Firefighters and supporters protested at City Hall against plans to get rid of 13 fire engines and slash 184 firefighters in the London Fire Brigade. Cuts and fire station closures have already increased response times, resulting in people who might otherwise have been rescued dying in fires or jumping to their death in attempts to escape. George Galloway was among those who came along to support the fire fighters protest, and he was pressed into speaking at the rally. There was also support from George Binette, Camden Unison branch secretary and other trade unionists. We were told of an alternative plan to make savings and avoid the loss of the engines had been made by Assembly Member Andrew Dismore. I left before the end of the rally and so missed several speakers. After the rally the fire fighters were going in to lobby assembly members and sit in the public gallery for the committee meeting discussing the cuts. An emergency protest by Stop the War in Parliament Square told MPs not to back David Cameron's motion to allow bombing of Syria, rejecting the case he had put forward. As on the previous Stop the War Syria protest there were no speeches by Syrians or Kurds, and no real attempt to take their views into account. And while the speakers all condemned the UK plans to bomb in Syria, there was no condemnation of the Russian bombing of the Syrian opposition, perhaps a greater threat to the Syrian people than Daesh, and certainly than the handful of UK planes. Among those protesting in Parliament Square were a number of supporters of President Assad, with the regime red, white and black flag with green stars, but whatever the official 'Stop the War' line, many of those at the protest were opposed to the Assad regime and Daesh as well as to bombing by the UK. It's rather unfortunate that the only organisation promoting large-scale protests against the bombing is Stop the War rather than one clearly supporting the aspirations of the Syrian people for freedom. Hours after I first published this, (though doubtless entirely by coincidence, and almost certainly in response to a letter signed by Peter Tatchell and 17 other prominent people in yesterday's The Guardian) the Stop the War website published an article 'For the avoidance of doubt' by John Rees, which makes seven points, the first of which begins "The STWC has never supported the Assad regime." Well, it's good to make that clear, because there have been many protests by Stop the War which Assad supporters have attended and appeared to be welcome, and by refusing to let Syrians opposed to the regime speak at this and other protests STW have certainly given that impression. The situation in Syria is complex, but some things are now becoming more clear, with what might two years ago have been dismissed as conspiracy theories now becoming fully-sourced mainstream views. It's now clear that while our government has fulminated against ISIS/Daesh it has also been complicit in support for them through its support of Saudi Arabia which provides support for their Wahabi ideology and more materially, for Turkey which is deeply involved in their oil exports, refining much of their output as well as providing pipelines and ports, and Israel which is the major customer for the smuggled oil. Not only is UK bombing immoral, it is almost certainly going to be ineffectual by design so far as inflicting real damage on the economic and military capability of Daesh, though catastrophic in effect on the civilians that will be bombed either deliberately or by accident. After the rally the protesters then marched to the Conservative and Labour Offices to deliver letters. They stopped first at the Tory HQ where a small delegation went into the yard through the police guard to deliver a letter, then marched on towards the Labour Party HQ. On the way a red smoke flare lit up the street for a minute or so in the middle of the march. The march halted briefly outside the Labour HQ for a letter to be delivered, and then made its way back to Parliament Square without further incident along Victoria St. At Parliament Square the official rally continued for a few minutes with protesters behind the main banner shouting slogans across the road to Parliament. When the Stop the War protest finished, many of the protesters stayed on, milling about the square, waving flags and chanting slogans. A couple of protesters climbed with large posters onto the plinth of the Churchill statue for a few minutes getting down when police approached. Others got into arguments with police over the use of megaphones, not allowed in Parliament Square without permission. It seemed likely that the situation would develop into minor acts of civil disobedience, with some encouraging sit downs on the street, but I'd had enough and decided to go home. Images taken in various odd moments on my travels around London, collected together for the month.